One of the most versatile families in Revit is the Generic Annotation (this is the same as the Symbol, on the Annotation ribbon). It is commonly used to create symbol-like families, such as keynotes, north arrows, graphic scales, and stamps. But it can also be used to generically annotate a drawing/ view. 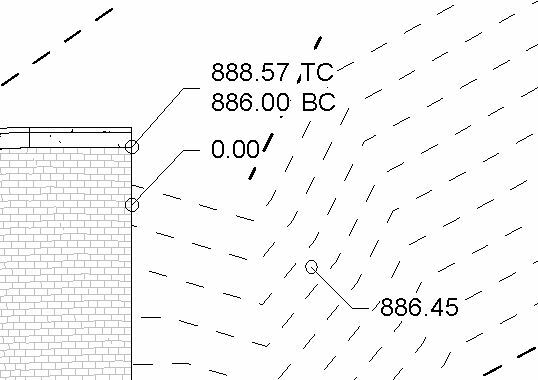 In typical Revit standards and best-practices, it is almost always preferable to use a Tag, since a Tag pulls actual information from the object. Generic Annotations are better than just “dumb” Text, but unlike Tags, they will not update if any information about the annotated object changes. Grading plans are one of the few exceptions to using Tags. First, Topography cannot be tagged. Instead, there is the Spot Elevation, which is similar to a Tag, pulling actual elevation information from the model. Unfortunately, Topo is cumbersome to manipulate and tends to lack accuracy, so pulling spot elevations from it might not be advisable. So, a generic Spot Elevation annotation is the next best thing. This Generic Spot Elevation family is set up to look like an actual Spot Elevation, so the two can be used together on the same plan. By default, it has 2 types: a single and a double spot elevation. Both can have a suffix. These parameters can be controlled from the Properties browser, or simply by clicking on the annotation within the view. The single spot also has the option to only show the suffix. Just like all Generic Annotations, when first loaded into a project, the Leader Arrowhead type parameter (for every type) must be adjusted from None. Also, the leader end will not truly snap to anything, since it has no true relationship to model elements.